I think I must have been doing too much cleaning lately and it's rubbed off on Felix. This morning he followed me around like a puppy, copying everything I was doing. I went into the laundry to put some washing on and Felix was right behind me. I started to put the clothes into the machine, but Felix was so keen to do it I decided to let him fill the washing machine instead. He did such a great job, scooping the dirty clothes up and putting them into the machine. The only problem is that he loves the buttons on the machine so much, he just keeps pressing them. He has somehow managed to program the machine so that it stops now before the clothes have spun dry. I can't work out how to change it so I have to manually put the machine on the spin cycle before I can hang out the clothes. Oops! Nathan bought Felix a mini cleaning set for Christmas. It has a little mop (which Felix uses as a duster), a broom, dustpan and brush and a bucket. 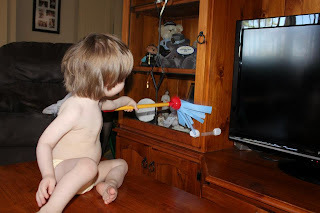 I found him 'dusting' the walls and the TV cabinet after he had finished with the washing. He looked so cute wearing his jocks, and nothing else, as he cleaned away. After his dusting, he came into the kitchen with me while I swept the floor. He picked up his little broom and helped me do the sweeping. I'm not sure if the front of the oven needed sweeping, but it got swept anyway. It made my cleaning a lot more fun (and take a bit longer) with my helper, but I wouldn't have it any other way. After Felix had his nap, Mel messaged me to ask if her and Noah could come over for a play. I was excited to see Noah in his Down Syndrome Awareness tshirt we gave him for Christmas (even though it looks like a dress on him). 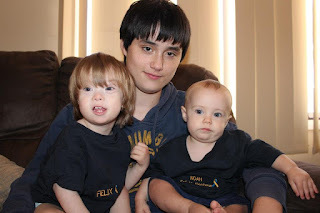 I put Felix's matching one on and we got some photos of the boys together. Felix was so good with Noah today. It's hard to believe that, up until fairly recently, Felix was really scared of Noah. Today they played together so well; sharing beautifully and having some cuddles. The only time Felix didn't look impressed with Noah was when he had to share his big brother, Isaiah, with him. Felix didn't appreciate Isaiah giving Noah attention. He likes having Isaiah all to himself. It was pretty funny actually, seeing Felix so protective of his big brother. 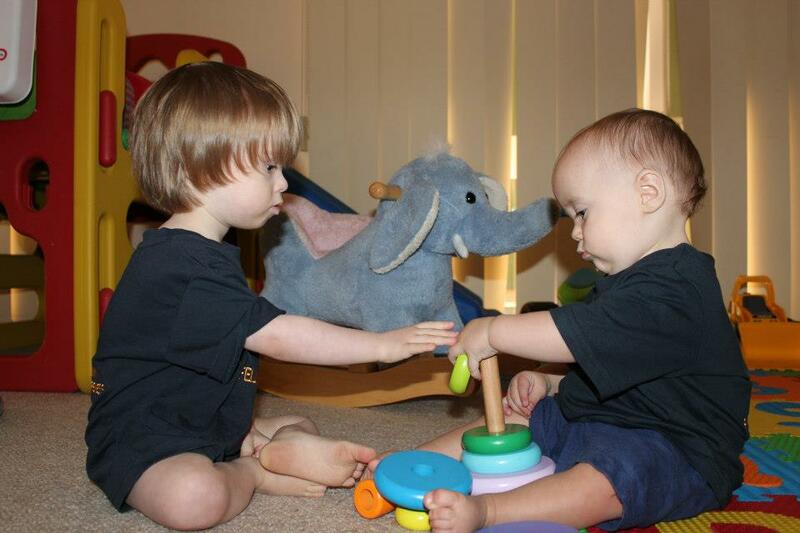 Noah and Felix were learning from each other today. Felix showed Noah how to put the wooden hoops onto the little stand. Noah watched him for a while and then he sat and tried until he successfully got one onto the stand too. We were pretty proud of our little Noah as, once he'd done it the first time, he did it over and over again. Later on, Noah was standing against the coffee table, banging both of his hands against it. Felix stood next to him and copied exactly what he was doing. Then Felix made a sound with his mouth and Noah copied the same sound back at him. They did this all afternoon; one of them would do something and the other would copy. It was great to see them studying each other and interacting so well. They're both such gorgeous little boys. Felix is going to miss his little nephew when he moves away in a couple of weeks. I think we might be making lots more trips to the city. 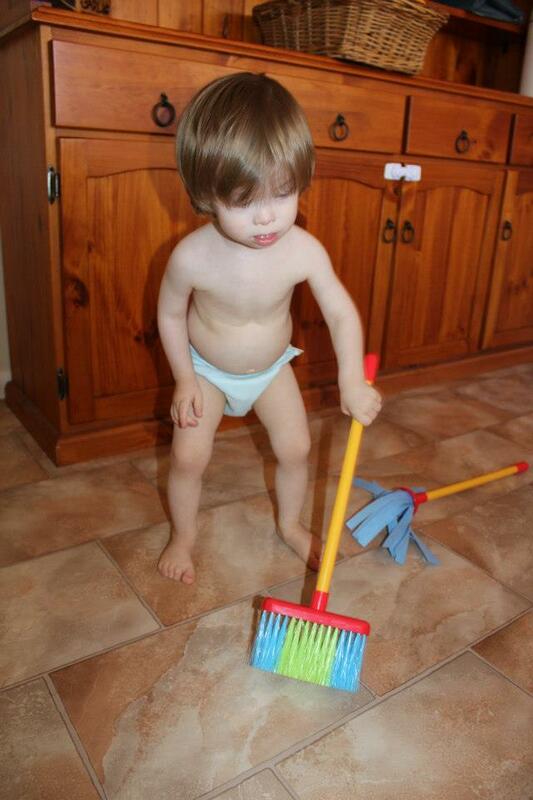 My son loves to clean with me,he has his own broom also;) I love seeing Noah & Felix together so cute. What a good boy you have :) I hope Felix keeps it up... Maybe in a few years I can sit back and watch while he does it all...hahaha!